This system is powered by a 7th Gen Intel Core i5 dual-core processor that features a burst speed of up to 3.6 GHz, while 8GB of RAM helps to ensure smooth multitasking and also allows the computer to quickly access frequently-used files and programs. The 13.3" IPS Retina display features a WQXGA 2560 x 1600 screen resolution with a 227 ppi pixel density. This MacBook Pro is equipped with a 128GB SSD, dual Thunderbolt 3 ports, Bluetooth 4.2, 802.11ac dual-band Wi-Fi, 720p webcam, dual microphones, stereo speakers. macOS High Sierra operating system. Creating the stunningly thin design of the iMac took some equally stunning feats of technological innovation. Apple refined, re-imagined, or re-engineered everything about it from the inside out. With Intel Core i5 processor, Thunderbolt, and groundbreaking storage options, the slimmest iMac yet is also the most powerful. OS X makes every Mac intuitive and easy to use. It also makes it simple to find, organize, share, and do just about everything. And thanks to iCloud, it makes your Mac, iPhone, iPad, and iPod touch work wonderfully together. Enjoy unbelievable detail on an unbelievable scale. The amazing Retina 5K display has 14.7 million pixels. So photographs look amazing, maps come alive, and text is incredibly sharp. 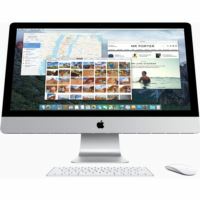 iMac with Retina 5K display is filled with high-performance technologies, yet it's still thin at its edge. 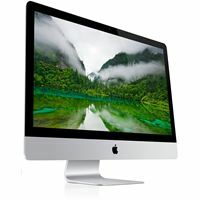 With Apple iMac with Retina 5K display you'll have all the performance and speed you need. Learn, play, surf, create. iPad gives you the incredible display, performance, and apps to do what you love to do. Anywhere. Easily. Magically. 9.7" display w/ 128gb storage. 10 Hour battery life, front/rear webcam. Includes carrying case and screen protector. 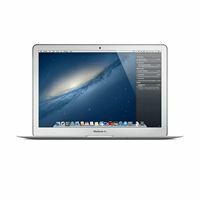 The 11.6" MacBook Air Notebook Computer from Apple is an ultraportable notebook computer with a thin and lightweight design. The system is loaded with 256GB of flash storage rather than an old-fashioned hard drive. At 11.6" in size, the 16:9 display features a native resolution of 1366 x 768. It features a glossy finish and LED backlight technology for enhanced image quality and energy efficiency. The computer is powered by a dual-core 5th-gen, low-voltage Broadwell 1.6 GHz Intel Core i5 processor and has 4GB of onboard 1600 MHz LPDDR3 RAM. 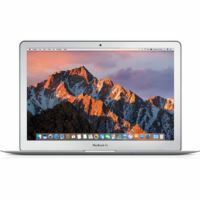 The 13.3" MacBook Air Notebook Computer from Apple is an ultraportable notebook computer with a thin and lightweight design. The system is loaded with 128GB of flash storage rather than an old-fashioned hard drive. Powered by a dual-core 1.6 GHz Intel Core i5 processor and has 4GB of memory. This MacBook Air comes preloaded with the user-friendly Mac OS X operating system. Apple Macbook Air 13.3" notebook is loaded with 256GB of flash storage. It also allows for impressive battery life -- up to 12 hours of web browsing. Powered by an Intel Core i7 dual-core processor and has 8GB RAM. Features a 720p FaceTime HD webcam, dual-band 802.11ac Wi-Fi, Bluetooth 4.0, and built-in stereo speakers. macOS is the installed operating system. 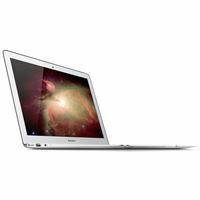 Apple Macbook Air 13.3" notebook is loaded with 128GB of flash storage. It also allows for impressive battery life -- up to 12 hours of web browsing. Powered by an Intel Core i7 dual-core processor and has 8GB RAM. Features a 720p FaceTime HD webcam, dual-band 802.11ac Wi-Fi, Bluetooth 4.0, and built-in stereo speakers. macOS is the installed operating system. 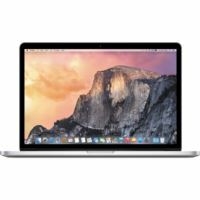 Apple 13.3" Macbook Pro w/ Touch Bar. The Touch Bar places controls right at your fingertips and adapts to different apps to provide useful functions without having to navigate complex menus or memorize keyboard shortcuts. The system features a 3.1 GHz Intel Core i5 dual-core processor, 8GB memory, a 512GB SSD, four Thunderbolt 3 (USB Type-C) ports, a Force Touch trackpad, a keyboard with a 2nd-gen butterfly mechanism, stereo speakers with double the dynamic range of its predecessor as well as improved bass, 802.11ac Wi-Fi, Bluetooth. 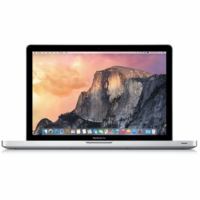 The 15.4" MacBook Pro Notebook Computer with Retina Display & Force Touch Trackpad from Apple is a powerful notebook computer with an innovative, ultrathin, ultraportable aluminum unibody design. 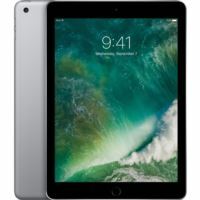 It is loaded with advanced power management features and an integrated lithium polymer battery, which work together to provide up to 9 hours of wireless web browsing. The 15.4" widescreen, LED-backlit IPS screen has a glossy finish and a native resolution of 2880 x 1800. Powered by an Intel Core i7 processor. Has 16gb on board memory and 256gb flash storage.